Pictured here: The Jewish holiday of Passover took place between March 30 and April 7 this year. During the Jewish celebrations, Palestinians face an increase in restrictions of movement and freedom. Here, Palestinian children walk a narrow temporary path to school, while settler children walk freely down the road accompanied by an armed soldier and two border police. Pictured here: On Tuesday, over the course of four hours, approximately 520 settlers invaded the Old City. 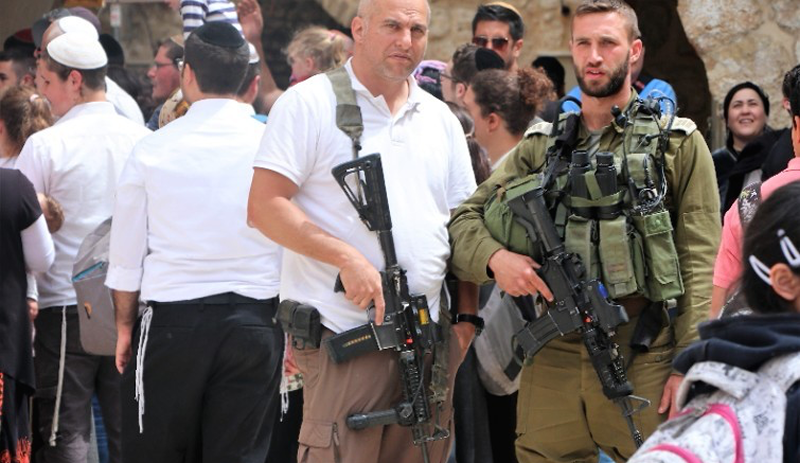 The settlers were surrounded by armed military forces. One shopkeeper we spoke with closed his shop before the settlers came, fearing that products would be stolen or damaged, as this has happened in the past. From where we monitored, we witnessed soldiers stop and check the IDs of six Palestinians. Pictured here: Locals gather outside of a police station near the illegal settlement of Kiryat Arba to demonstrate against the atrocities committed against Palestinians in Gaza. Following the midday prayer, demonstrators peacefully marched down the road, where they were met with Israeli soldiers and border police. Christian Peacemaker Teams — Palestine calls on all people to contact their governing bodies and urge them to hold Israel accountable for its actions of genocide against the Palestinian population. Pictured here: A military vehicle sprays skunk water indiscriminately down the streets. Shops, homes, the local community, members of the press, and anyone else who happened to be outside are caught in the spray. Pictured here: This Palestinian man is violently thrown against the wall and roughly body searched at 7:00 AM. The man, who initially did not want to be body searched, is taken into custody. For insisting on his rights, he is arrested and taken to the police station. Via the Alternative Information Center (AIC).